Inso's World: Travels and reflection. Hello and welcome to Inso's World. Today is the 11th September and it immediately makes me think of what happened in the US fifteen years ago; namely the terrorist attack on the twin towers, the pentagon and what followed. At the time, I was away from home; staying in a hotel whilst I was travelling to and from a Merlin Helicopter course. During the day, details were sketchy and we had no real idea of the severity of what had happened. When we returned to the hotel in the evening of the 11th, there was a sombre atmosphere and the screens behind the bar were showing the events of the day. The first Images I saw were of the second tower coming down, followed by replays of the pair of them falling. I was immediately struck silent before the barmaid said to me how terrible it was. My response was "we're going to war". The events of that tragic day began a chain that has ended up where we are today in 'the war on terror'. The cost of what happened on that day goes so much further than the lives lost in the towers, the surrounding streets, the Pentagon and in a field on the way, when passengers bravely brought down their own aircraft. It goes further than the emergency crews that lost their lives. It goes further than the trauma that lives in those people as a result of what happened in those dark hours and the aftermath. It is an event that should be remembered as a remembrance for those who died, those who have been traumatised as a result and the fact that from that one single act, the world changed. Today, I read a small Facebook post from a woman who has cancer. I have been following her little posts for a long time and I think that it is very likely that the post I read, was likely to be one of her very last. To read that she has been admitted to the hospice for the last time, had signed off her DNR (do not resucitate) form and had found time to write an emotional post reflecting on her young children, family and followers was as humbling as it was upsetting. I wish her safe travels and my thoughts are with her and her family. This week has been one of travels and education as well as not getting much sleep. I was having to travel into London on a daily basis to attend a Charity Management Awareness course. It was a very interesting course which opened my eyes to a lot of aspects of charity that I hadn't really thought about... so it has definitely started my preparation for joining in with the charity sector in the new year. The one piece of advice I would give to anyone thinking of taking on a higher level role in a charitable concern would be to do your homework first. There is a lot of responsibility and accountability in charity that people will not necessarily be aware of. 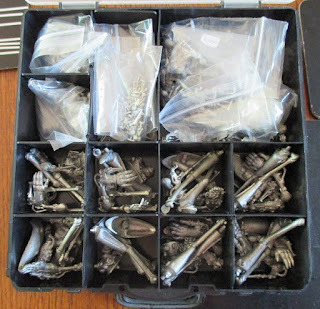 It is amazing to think that in this one little box, there are a hundred troops, eight dreadnoughts and various other spare bits and pieces. 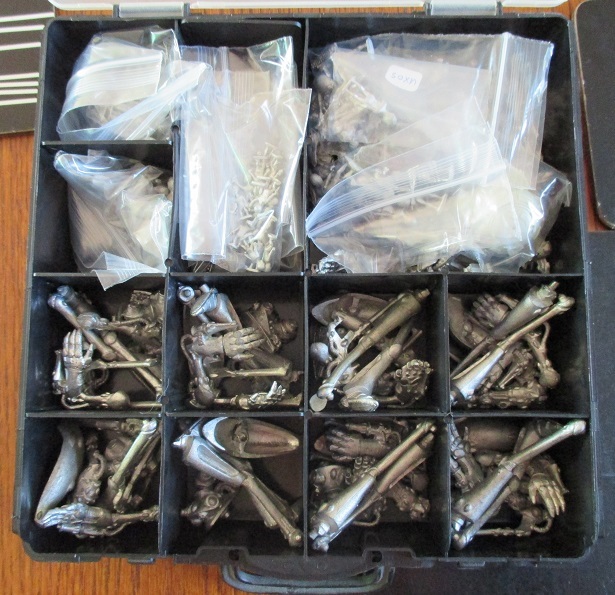 In this box, there are two more waves of Visitors (each with leader, troops and dreadnoughts), scouts and special additions. 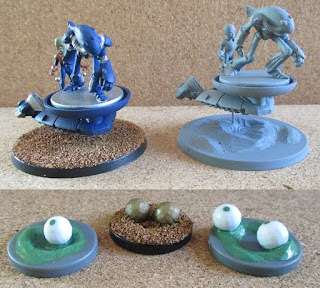 The picture shows both converted champions with one being a bit further along in the paint department, than the other. Neither are finished and both have a long way to go. The MDS bases show two that are ready for base coating and one that is finished. I could have tried to repose the second of the champions but I like the crouched position and it would have been a tricky process... so I left him as he was. That is that for today. See you through the sands of time!